Events designed to inform parents about Internet Essentials and how they can enroll. “The Internet Essentials Learning Zone is designed to help students succeed academically. 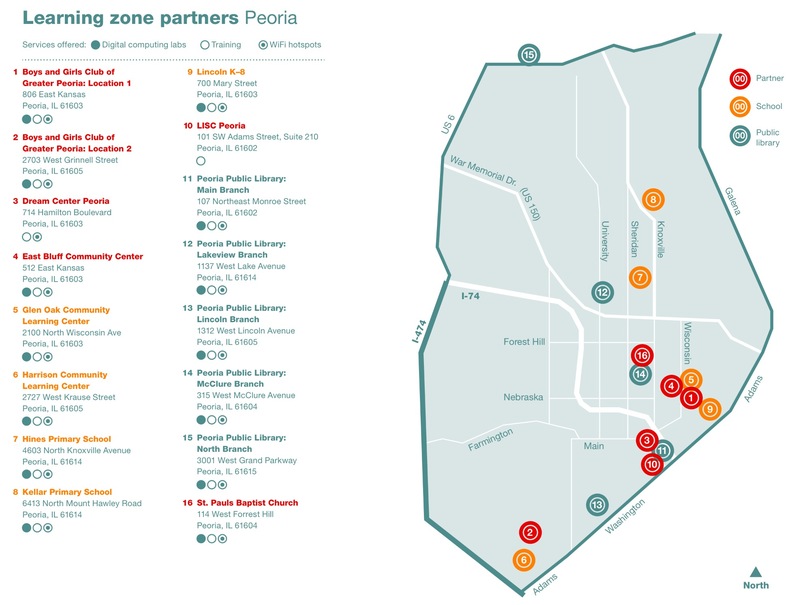 I’m pleased that students who live in or visit the zone will have expanded access to the Internet and be able to use it for homework, for research and to communicate with their schools and families.” said Dr. Grenita Lathan, Superintendent of Peoria Public Schools District 150. Dr. Lathan added that students visiting several of the participating learning zone partner organizations also can gain access to free breakfast and lunch through the Summer Food Service Program, which is sponsored by the United States Department of Agriculture (USDA). More information and menus can be found on the Peoria Public Schools website, located at www.psd150.org. “The zone will extend learning opportunities beyond school walls by giving students access to computers and the Internet via indoor WiFi at libraries, community- and faith-based organizations many of them already visit for after-school and other programs,” said Matthew Summy, Regional Vice President of External and Government Affairs. Comcast also announced that nationwide enrollment has increased to 300,000 households, which means the program now connects about 1.2 million low-income Americans – 100,000 in Illinois alone – to the Internet at home, many for the first time. Comcast, which originally planned to stop accepting new applications at the end of the 2013-2014 school year, also announced recently that it will extend enrollment in the Internet Essentials program indefinitely. Internet Essentials from Comcast is the nation’s largest and most comprehensive broadband adoption program. It provides low-cost broadband service for $9.95 a month plus tax; the option to purchase an Internet-ready computer for under $150; and multiple options to access free digital literacy training in print, online and in-person. A household is eligible to participate if it has at least one child eligible to participate in the National School Lunch Program (NSLP), is located where Comcast offers Internet service, has not subscribed to Comcast Internet service within the last 90 days and does not have an overdue Comcast bill or unreturned equipment. Families that enroll in the program can continue to enjoy the service as long as one child eligible to participate in the NSLP is living in the household. For more information about Internet Essentials visit InternetEssentials.com for English and InternetBasico.com for Spanish. Educators or third-parties interested in helping to spread the word can find more information at InternetEssentials.com/partner. Parents looking to enroll in the program can call 1-855-846-8376 or, for Spanish, 1-855-765-6995. Comcast Corporation (Nasdaq: CMCSA, CMCSK) is a global media and technology company with two primary businesses, Comcast Cable and NBCUniversal. Comcast Cable is the nation’s largest video, high-speed Internet and phone provider to residential customers under the XFINITY brand and also provides these services to businesses. NBCUniversal operates 30 news, entertainment and sports cable networks, the NBC and Telemundo broadcast networks, television production operations, television station groups, Universal Pictures and Universal Parks and Resorts. Visit www.comcastcorporation.com for more information. With more than 7,000 local employees, Comcast’s Greater Chicago Region (www.comcastgcr.com) serves customers in central and northern Illinois, including the Chicago area, northwest Indiana and southwest Michigan. “Like” Comcast’s Greater Chicago Region on Facebook by visiting Comcast of Illinois, NW Indiana and SW Michigan. “Follow” Comcast’s Greater Chicago Region on Twitter at @ComcastIllinois. Become an Xfinity VIP by texting XVIPFB to 47211 and get product updates and discounts on local events.